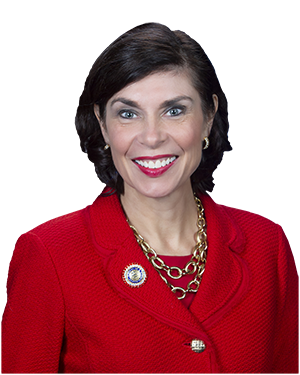 Kristin Phillips-Hill was elected to serve York County residents in the Pennsylvania Senate in 2018 after serving two terms in the House of Representatives. As a former small business owner, Kristin has made government efficiency a point of emphasis throughout her tenure in public service. As a member of the Common Sense Caucus in the House in 2017, she helped uncover special fund accounts and balances totaling more than $3 billion to help end a budget impasse and balance the state’s books without the need for a broad-based tax increase. She led the fight to expose the gross misuse of taxpayer dollars by the Susquehanna River Basin Commission. She takes her responsibility to manage taxpayer dollars very seriously. She does not participate in the State Employees Retirement System or health insurance program, and she commutes to and from Harrisburg using her own vehicle without accepting mileage reimbursement. Kristin is passionate about ensuring a quality education for young people throughout the commonwealth. She served on the school board of the Dallastown Area School District for three years and did not raise taxes during her entire tenure. As a lawmaker, she helped create a program to help at-risk youth earn a high school diploma or equivalent education, as well as a law to help veterans, military members and their families maintain state teaching certification when they are forced to relocate. Her experience in both state and local government gives Kristin a unique perspective on the process of funding our schools, which is why she lists property tax relief for her constituents as a priority. Having realized the challenges associated with owning a business, Kristin is a strong proponent of improving Pennsylvania’s business climate. Kristin authored a key piece of legislation to prevent the growing crime of identity theft by making it illegal to possess a credit card skimmer or any other device that allows thieves to steal personal information encoded in a payment card. Community involvement is a staple in Kristin’s life. Her extensive volunteer experience includes serving on the board of directors for both the York County Convention and Visitors Bureau and York County History Center. Kristin earned a bachelor’s degree in political science and a master’s degree in public policy from Rutgers University. Kristin resides in York Township, with her husband Rick. They have three children: Victoria, Gavin and Spencer.